At first glance, Hong Nian is like any vegetarian stall in coffee shops or food centre. Though the stall only offers economical mee hoon and vegetarian chicken rice, we notice that there is always a long queue. A long queue is a sign of good food. So is it true for Hong Nian? 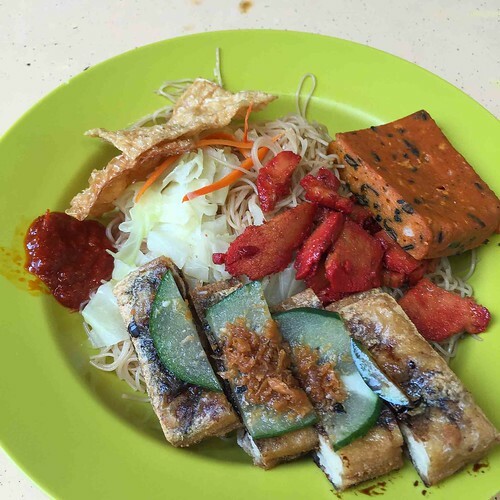 We cannot resist trying the vegetarian otak. We like the texture and spiciness. The fried beancurd with sliced cumumber is also very crispy. However, both cost $1 each, which makes the mee hoon cost $4.50. Our Mee Hoon is not so economical in the end. Nevertheless, the mee hoon from Hong Nian tastes quite good. 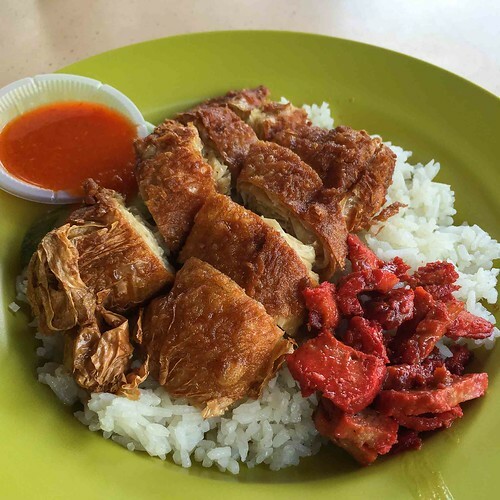 The vegetarian beancurd chicken is really crispy, and the char siew soft. It is value for money and quite a good eat. We now understand why our readers recommend Hong Nian. Though it only offers basic vegetarian cuisine, they are really value for money. If you have more time, you can also take a bus to Divine Realm or Nature Delights.